TS ICET 2018 Answer Key ,Response Sheets Download @ icet.tsche.ac.in Telangana ICET Preliminary , final Answer Key with Question paper. Kakatiya University released Telangana ICET Preliminary Key for all sets date wise, session wise with Solutions & Question papers on behalf of its official website icet.tsche.ac.in. Check Telangana ICET 2018 Preliminary answer Keys for MBA, MCA subjects. Kakathiya University will release TS ICET 2018 answer key in online mode for all the candidates who appeared in the entrance exam. The university will first release the TS ICET 2018 preliminary answer key on May 23rd and 24th exams, allowing the candidates to challenge it. Candidates can download answer key with Question papers Date Wise Session wise 23rd and 24th May 2018. 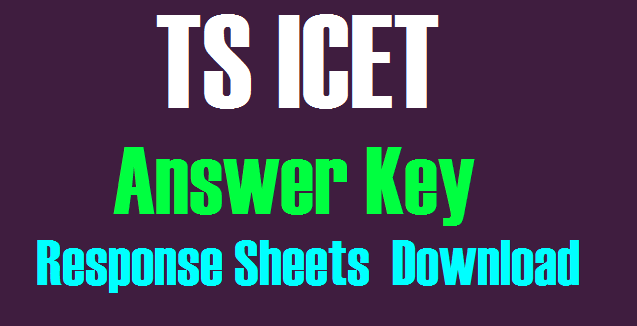 TS ICET Answer key with Question paper are available to download. TS ICET – 2018 (Telangana State Integrated Common Entrance Test) is for admission into M.B.A. and M.C.A. courses of all the Universities in Telangana State and their affiliated colleges for the academic year 2018-19.TS ICET Exam held in 23rd and 24th May 2018 across the state. Candidates who appeared for TS ICET Exam can check answer key to estimate your score and ranks. TS ICET 2018 answer key will appear on the screen. Download it. Enter TS ICET registration number and hall ticket number to be able to access the exam response sheets. Verify answers given in the response sheets with the ones provided in the answer key. Calculate probable scores using the answer key.